A Depression-era block first shared in the Spokane Daily Chronicle newspaper, this Double Windmill pattern is a perfect opportunity to showcase a large, scrappy collection of reproduction fabrics. 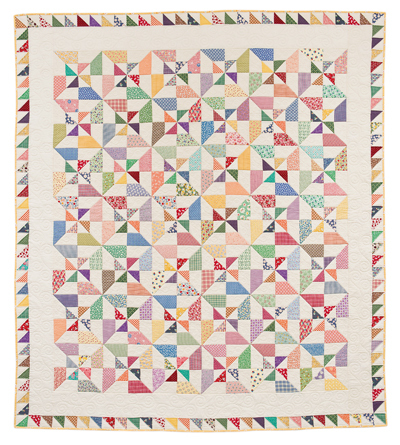 Use just two pattern pieces, including one template, to make this single-block quilt. Finish it with a striking Sawtooth-style border. Finished quilt: 83" x 94"
Kay Connors was born in Texas, raised in New Mexico, and she has had homes in Colorado, California, Washington, Alaska, and Idaho, where she has lived since 1979. She has been quilting since 1973, first to use up fabric, and then to feed her passion. 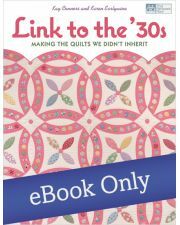 She is a contemporary quilter but finds she can't pass up anything having to do with old quilts. She buys feed sacks, old quilt tops, quilts, and every piece of reproduction '30s fabric she finds. Collecting old patterns and drafting her own from found quilts has allowed her to make quilts that she feels need to be in her home. In 1998, Kay and her sister, Karen Earlywine, bought a little house in the hill country of Texas as a quilting getaway. Karen Earlywine was the youngest of four children in a post-war family in Texas. She was two years old when the family moved to New Mexico. Karen, her husband, and their grown children still live in the southwestern part of the state. 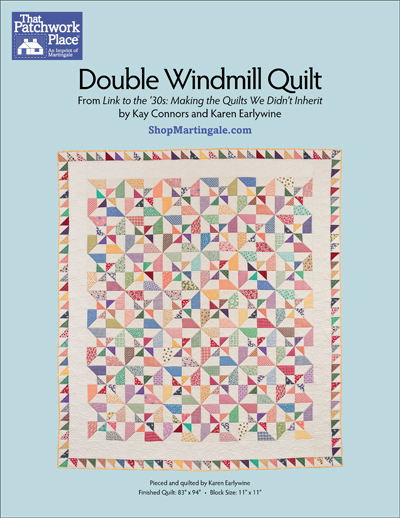 Quilting became an important part of Karen's life in 1977. Now the most important thing in her life is her family. Four young grandchildren have new quilts as they go from cradles to cribs to beds. College graduations and other events in the lives of close friends and family are celebrated with the gift of a quilt. Years of working on old homes and collecting antiques intensified the interest Karen has in reproduction fabrics and quilts of the past. She and sister Kay Connors both share this passion and try to get away to their shared house in Texas to scout the area for fabric and antique treasures as often as possible.